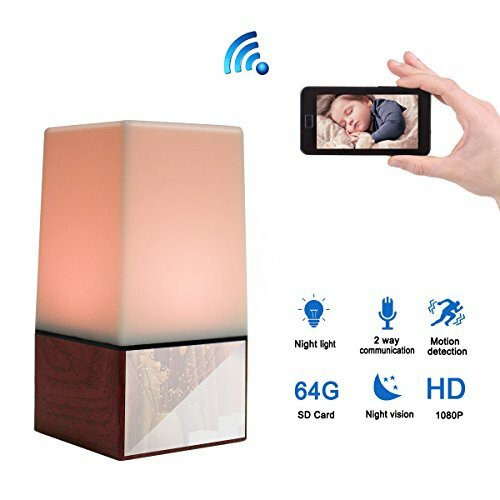 The newest night light camera in 2018. It's a very good tool for home security,baby monitor. Supports multiple smart phone watch live video at the same time,You can Share live videos with your family, friends and beloved ones,to let the happy moments to come to more people or monitor home with more people, to bring you more peace of mind.If you don't want,please set password. 1.Full 1-Year the Quality Warranty. 1.Colorful Night Light Camera:The newest night light camera in the market.Combine the camera with the night light perfectly to make it much smarter and much more secret.With the smooth glass cover,people will hardly discover it is a camera.What's more, you can adjust the color and brightness,and even the definite time to turn on/off the night light by countdown on the smart app. 2.Consummate night vision effect: Multiplied by the 10 Ir night vision lights under the glass cover, you will see an unprecedented clear video in the dark.Any other similar products in the market which has only 1~3 ir lights will never match. 4.1080P HD:The video resolution 1920 x 1080P,you can see exactly what's going on through video.We have great confidence in this.We are the real 1080P. 5.WIFI Connection:Stable wifi connection,make you know what is going on at your entire house when you are out easily.Support real-time video remote view by Smartphone APP( ios or android )anytime anywhere.Special function is 2-way-communication,you can talk to your home after setting the clock to router. View More In Hidden Cameras. If you have any questions about this product by Poetele, contact us by completing and submitting the form below. If you are looking for a specif part number, please include it with your message. YSD Spy Camera, 1080P HD Hidden Camera with Motion Detection Mini USB Adapter, Support 32GB Internal Memory, Perfect for Home Security Nanny Pet Surveillance. Infrared Night Vision Mini Hidden Spy Camera Full HD 1080P with 140° Wide Angle,Wearable Mini Spy Camera Wireless Outdoor/Indoor Sports DV Motion Detecting PC Camera Taking Photo Driving Recorder.